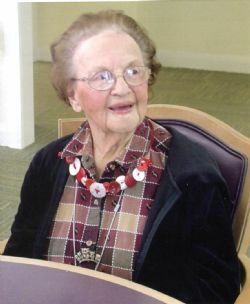 Florine Heinroth, 101, of Lake Jackson passed away, Friday, February 1, 2019. She was born August 1, 1917 in Victoria, Texas to James Rypple and Josephine Garek Rypple. Florine was a member of St. Michaels Catholic Church. She was preceded in death by her parents; her husband of 49 years, Stanley Heinroth; one son, Dennis Heinroth; a grandson, Ryan Barnes; three brothers; two sisters; and her sweet pup, Leo. Florine is survived by three children, Mary Gerwig (Don Freudensprung) of Brazoria, Janis Barnes (Danny) of Lake Jackson, Jill Reeves (John) of Dallas; daughter-in-law, Tommye Heinroth; ten grandchildren, Marcos Garza, David Garza (Jenny), Michael Heinroth (Renee Foegelle), Jacob Garza (Carol), Sean Heinroth (Christina), Emily Brandesky, Nick Garza, Stan Heinroth (Kristina), Jeffrey Barnes, Kristi Fisher (Michael), and 11 great-grandchildren. Funeral services will be at 11:00 a.m., Thursday, February 7 at St. Michaels Church in Lake Jackson. The family wishes to express their appreciation to the staff at Carriage Inn Assisted Living and A-Med Hospice. The family requests in lieu of flowers, donations to the SPCA of Brazoria County.